You see I believe in the saying "behind every great man there's a great woman." And until now Watch Patina has been missing the female perspective. 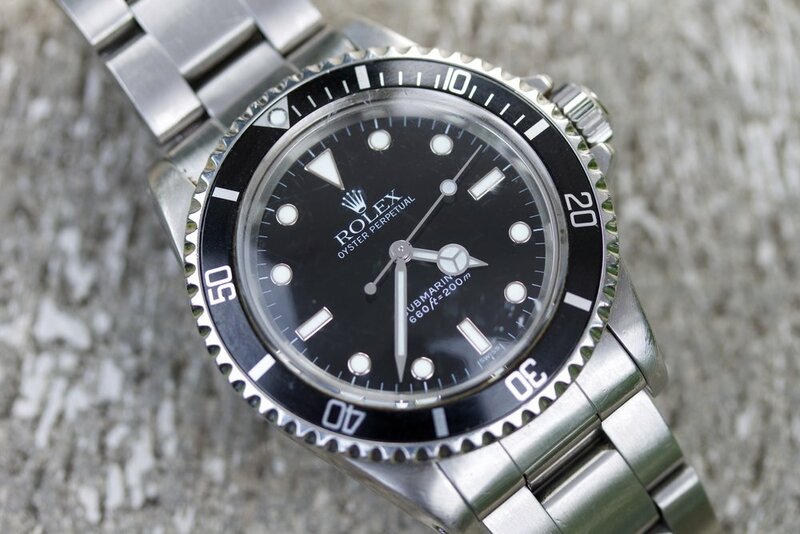 So we're very proud to have our first female guest take center stage and share some intimate details about her relationship with a special timepiece: a circa 1986 Rolex Submariner ref. 5513 that belonged to her dad. When I first laid eyes on Darcy's Submariner, I immediately noticed the 660 ft depth rating printed on a dial marked "SWISS" instead of "SWISS - T < 25." Call me shallow, but I was really hoping Darcy's Sub had a creamy, matching tritium dial. But as soon as Darcy told me the reason she surmised her dad fell for this watch - because at his core "he's not a very superficial person; [that] he would drive his cars into the ground and he was more of a saver" - I began to see past the replacement dial and accept the watch as an extension of its former owner, not as a collectible item to be scrutinized. I gathered from Darcy that her dad was obsessed with his Sub. Occasionally Darcy would catch her dad staring at the dial - like someone staring off into space. But his laser-beam-focus had nothing to do with analyzing the shade of patina or alignment of the font; it had more to do with simply admiring a prized object he treated himself to after he retired. You see, it was actually quite out of character for her dad to splurge on himself, especially to buy himself jewelry. Ever since he lost his wedding ring - when it flew off during an altercation while working his beat as an NYPD homocide detective - her dad didn't wear any. Darcy saw him purchasing a Rolex watch for himself as an act of "self love; caring about himself; he was really proud of it." Darcy became the newest proud owner of this Sub after her dad passed away last December. She came upon it at his New York co-op while going through his personal effects with her sister. She asked her sister if she could have the watch... "I thought you would want that; I could totally see the watch for you" said her sister. His Sub made sense for Darcy because she was the tomboy of her dad's daughters. "When he was smoking cigars he wanted me to take a puff from his cigar - kinda treated me like a son sometimes," she told me with a smile. Being new to watches, especially wearing a substantial men's watch, Darcy's first impression was that "wearing a watch is a funny thing, it's such a commitment, it's such a serious piece of equipment and with the cellphones a lot of people just don't want to wear watches anymore." But Darcy wasn't about to sell this watch or keep it in a drawer. "When he died I wore it everyday." In fact she didn't even mind that it wasn't keeping time very well. She even considered keeping the watch on New York time - even though she lives in Chicago. The accuracy or utility didn't really matter. What was important was that it was a momento of her father's life; an object that sparks memories of him. Our hour-long conversation left Darcy seriously contemplating restoring her dad's watch. 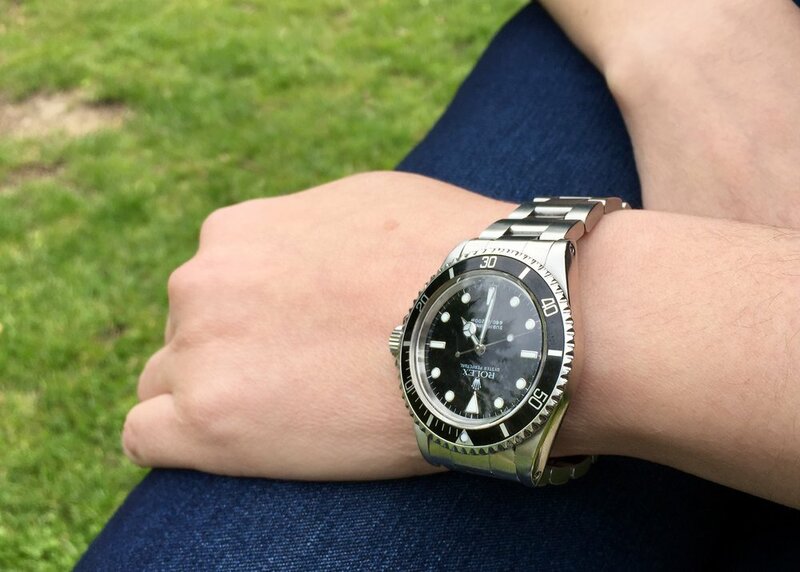 "When I look at my arm in the Submariner I feel like my father looking at his own watch. I want him to know that I care too for this special timepiece. His first and only Rolex."